Griffin was rescued in May 2016 she was a scruffy yellow pup suffering from a machete wound and very fearful of people. 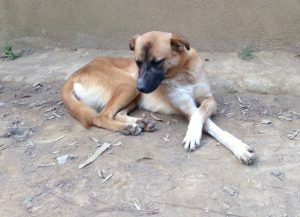 Since then with a lot of love and encouragement from staff and volunteers she has blossomed into a beautiful 1 year old. She has learned to trust again and though a little skittish with new people at first she is friendly and happily greets us now. Whilst here she bonded with Bridget our beloved matriarch of the clinic dogs. Sadly Bridget just passed away and so Griffin is at a loss. We would love to see her find her forever home and family to bond with.